As part of Diabetes Awareness Month, the American Recall Centre have been collecting advice and tips on living with diabetes from other bloggers. I was lucky enough to be approached for my two cents worth and my advice was (and still is) to ‘Be kind to yourself; take time for yourself to avoid burnouts’. Check out their blog post and what they have gathered so far here. My little tip is based on personal experience and I also think it’s something that many people can relate to. In hindsight, I wished someone had given me this nifty piece of advice in my early years of diagnosis. Being told I had type 2 diabetes felt like a slap in the face. With the limited information I had from the media and brief introductions to diabetes in health subjects at uni, I felt like a failure. Was this my fault? Could I have prevented it? Is my lifestyle really that bad? So I changed my lifestyle. Drastically. Everything I ate came under scrutiny. I made myself hit the gym at least once a day. I became extremely conscious of my weight. I was miserable, angry and hated diabetes. Yet, despite all the changes I made, my BGLs didn’t budge. All the tablets I took made minimal difference to my HbA1c. I was frustrated and angry at my consistent high BGLs. But most importantly, I was exhausted with my regimented lifestyle. And I am sure I’m not the only one who went through this! But you know what? Feeling burnt out with diabetes is pretty common. Particularly since diabetes is a condition we manage 24-7. Everything we do and eat will impact our BGLs and consequences of a miscalculation is not pleasant. Learning to take the reins of diabetes rather than allowing diabetes to control my life took a long time. Yes, it’s important to get good glycaemic control to prevent complications down the track. But I won’t be a slave to it. I am only 23 years old (for the next few days anyway!) and I want to live my life. At the end of the day, diabetes is a delicate balancing act on top of everything else life throws at us. Being kind to yourself means that sometimes it’s okay to have that delicious, fresh custard donut. Going to the gym shouldn’t be a chore; exercise by doing something you love and enjoy. Pamper yourself once in a while and have something to look forward to each day. Going to those dreaded doctor appointments? Why not treat yourself to something nice afterwards. It’s okay to be frustrated and vent; in fact, share your frustrations with the Diabetes Online Community! Don’t be angry at that number on your meter, fix it the best you can and move on. There is no benefit in harbouring anger or blaming diabetes all the time, no matter how it came about. So, my advice for everyone (even people without diabetes) is to take some time out for yourself now, rather than falling apart in shambles later on. 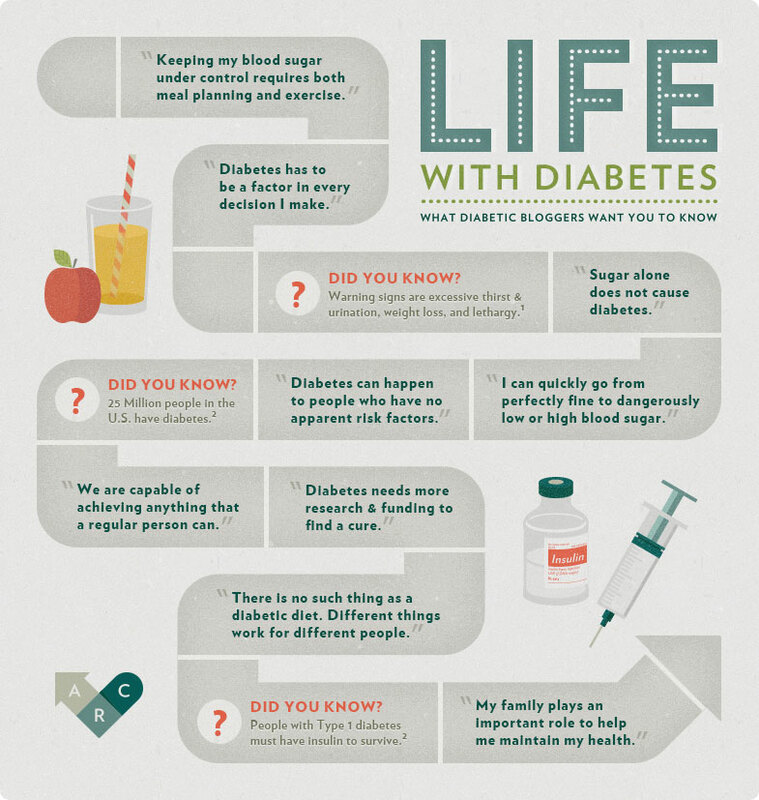 Life with diabetes – what bloggers in the diabetes community want you to know.